By trying to bring an end to the Russo-European Nord Stream 2 project, the US is pursuing its own economic interests rather than taking care of Europe's energy security. Washington is seeking to boost sales of its own expensive liquefied natural gas to Europe, thus undermining the Old Continent's competitiveness. Washington is making every effort to disrupt the implementation of the Russian-led Nord Stream 2 Project aimed at providing the EU with 55 billion cubic meters of Russian natural gas per year, through a pipeline across the Baltic Sea to Germany. While testifying before the House Foreign Affairs Committee on May 23, Secretary of State Mike Pompeo stated the US would "continue to push [for] Nord Stream 2 to be ended," which the US sees as a threat to the EU's "energy security." For his part, the US ambassador to the EU, Adam Shub, has urged "all EU member states to join the chorus of nations on both sides of the Atlantic to oppose Nord Stream 2 and support the future of Ukraine gas transit." — Adam Shub (@USAmbEU) 25 мая 2018 г. ​According to Shub, for Russia "gas is not simply a commodity to be traded — it is a foreign policy tool and a weapon." ​Earlier, on May 17, The Wall Street Journal reported that US President Donald Trump allegedly told German Chancellor Angela Merkel that the US would start talks with the EU on a new trade deal if Berlin ceased implementing the Nord Stream 2 project. In response to signals from Washington, the Russian Embassy in the US tweeted Wednesday that the White House is seeking to "impose its own uncompetitive LNG [liquefied natural gas] on Europe," referring to the US's longstanding struggle against Russian-Europe gas pipelines since the time of Ronald Reagan. Ronald Reagan opposed the building of a Soviet gas pipeline in t/ 80s. Now the administration is defending that pipeline because it runs through Ukraine. By attacking the @NordStream2 Washington imposes its own uncompetitive LNG on Europe. — Russia in USA 🇷🇺 (@RusEmbUSA) 24 мая 2018 г. According to Russian economic observer Maxim Rubchenko, there are four countries strongly opposing Nord Stream 2: the US, the UK, Ukraine and Poland. Each of them is pursuing their own political and economic interests. The US is seeking to boost its LNG sales in Europe. According to the US Energy Information Administration (EIA), the country is building up its liquefaction capacities in the face of growing gas demands both in Europe and Asia. "US LNG exports will exceed 3 billion cubic feet per day in 2018 and over 12 billion cubic feet per day by 2035. LNG exports are expected to support up to 452,000 new jobs and add $73 billion to the US economy by 2040," the Institute for Energy Research (IER) predicted in October 2017. The problem is that US LNG is 20 percent more expensive than Russian pipeline gas, the observer underscored. As Oilprice.com noted last June, American LNG is "$1-2 above northwestern European benchmark gas prices, which does make it uncompetitive." The UK supports Washington's efforts to throw a wrench in the Nord Stream 2 endeavor. London's rationale is clear, Rubchenko notes: It is striving to maintain control over continental Europe after the much-discussed Brexit and replace Germany as Europe's flagship. Additionally, British Petroleum has already signed an agreement to buy LNG from America's Venture Global for the next 20 years. As for Poland, it is apparently demonstrating loyalty to the US amid Warsaw's political frictions with Brussels and at the same time is trying to promote its own Baltic Pipe. Kiev's concerns are crystal clear: it fears that Nord Stream 2 will spell an end to gas transit through Ukraine. Although Vladimir Putin emphasized that gas would continue to flow through Ukraine after Nord Stream 2 becomes operational, Ukraine and its American partners want the endeavor to be nipped in the bud. ​"We categorically reject any notion that Nord Stream 2 would be acceptable were Russia to 'guarantee' a minimal volume of gas transit via Ukraine," Shub tweeted May 25. — US Mission to the EU (@US2EU) 25 мая 2018 г.
Germany is not interested in abandoning the beneficial project especially in the wake of the imposition of tariffs on aluminum and steel imports by Trump in March 2018 and the US administration's recent investigation into car and truck imports that may lead to new taxes. According to some estimates, after the launch of the pipeline, European consumers will be able to save about 8 billion euros annually by reducing the cost of transporting hydrocarbons from Russia. On the other hand, switching to expensive US LNG may undermine the competitiveness of European industries. Earlier the White House threatened EU companies involved in the Nord Stream 2 endeavor with sanctions under the Countering America's Adversaries Through Sanctions Act (CAATSA). However, Rubchenko believes that Washington will not punish European businesses: Instead, the Trump administration is likely to pressure Denmark and Sweden into prohibiting construction works for the Russia-led project. Thus, Pompeo spoke by phone with Swedish Foreign Minister Margot Wallström on May 17, discussing the "danger that Nord Stream 2 poses to European energy security," among other issues. — Nord Stream 2 Corp. (@NordStream2) 23 апреля 2018 г. ​"Europe does not have an alternative [to Nord Stream 2], it is impossible to substitute these volumes [of gas] from other sources," said Gerhard Schroeder, a former chancellor of Germany and chairman at Nord Stream AG, at the St. Petersburg International Economic Forum on May 25. "In Brussels, one should adopt a rational approach to the project. There are no arguments against Nord Stream 2, they are all invented. There are certain private interests behind this resistance." Schroeder further noted that the US is trying to throw sand in the gears of the endeavor to prop up US LNG sales in the Old Continent "regardless of whether its standards meet Europe's gas processing facilities." He expressed hope that EU member states would resist Washington's pressure and protect Nord Stream 2. Earlier, German Foreign Minister Heiko Josef Maas highlighted that the implementation of the Russia-led endeavor would not lead to Europe's dependence on Russian gas. "We have the opportunity to receive liquefied natural gas in Europe and in Germany," he said while delivering a speech in Helsinki. "So there is diversification, and we will not be bound to Russia." He reiterated Berlin's notion that Nord Stream 2 is a purely commercial initiative, adding that French and British companies are also involved in its implementation. At the same time the foreign minister admitted that he understands why the project had been politicized. "The political dimension was attached to [the project] because [after the construction of the Nord Stream 2] the flow of gas through Ukraine will not be the same. Ukraine is losing revenue from transit, which they need to continue to rebuild the country," Maas said, referring to Putin's promise to preserve the flow of gas through Ukraine in case it makes economic sense. While Shub is calling upon "EU member states who view dependence on Russian gas as a national security threat," Shroeder and other proponents of Nord Stream 2 underscore that the pipeline will not only meet Europe's growing needs in hydrocarbons, but also create new jobs in Europe. 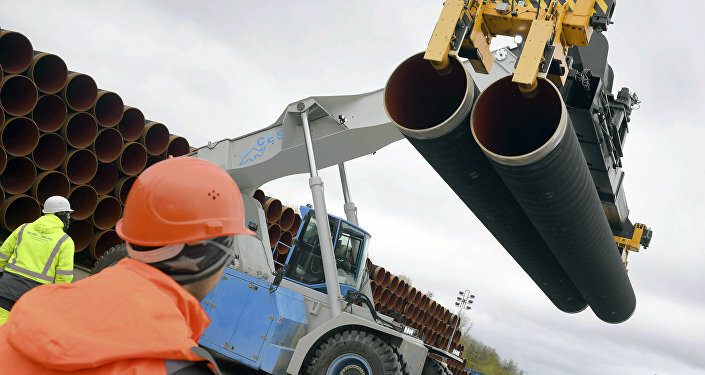 "The total economic benefit of current Nord Stream 2 commitments will be over 5.15 billion euros, creating 31,000 full-time-equivalent jobs and adding 2.25 billion euros in GDP in a five-year period," the project's official site reads, citing a labor market and economic impact study published in October 2017 by management consultancy Arthur D. Little.